Remove the cvt shift selector finisher (cvt: re0f11a). Refer to tm-253, "removal and installation". 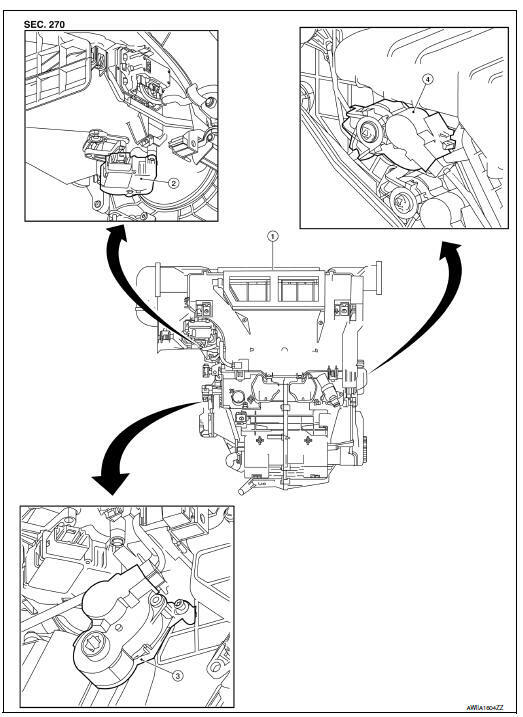 Remove the MT shift selector finisher (6MT: RS6F94R). Refer to TM-22, "Exploded View". Remove the front air control screws. Release the front air control metal clips using a suitable tool. Disconnect the harness connectors from the A/C assembly switch and remove. Remove the AV control unit. Refer to AV-406, "Removal and Installation". Remove the AV control unit bracket screws (A). Remove the A/C auto amp. 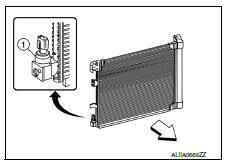 The intake sensor is serviced as an assembly with the heating and cooling unit assembly. 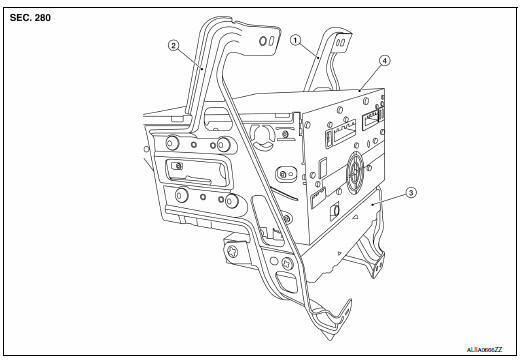 Refer to HA-43, "HEATING AND COOLING UNIT ASSEMBLY : Removal and Installation". Remove the refrigerant pressure sensor (1). Cap or wrap the opening of the refrigerant pressure sensor with suitable material such as vinyl tape to avoid the entry of air. Apply a/c oil to the o-ring of the refrigerant pressure sensor for installation. Remove the heating and cooling unit assembly. 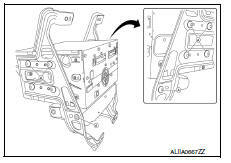 Refer to ha-43, "heating and cooling unit assembly : removal and installation". Disconnect the harness connector from the intake door motor. Remove the intake door motor screws and the intake door motor. Remove the front floor duct LH. Refer to HA-42, "Exploded View". Disconnect the harness connector from the mode door motor. Remove the mode door motor screws and the mode door motor. Remove the air mix door motor screws and the air mix door motor. Disconnect the harness connector from the blower motor resistor. Release the pawls using a suitable tool and remove the blower motor resistor.